CyberCucina.com offers a wide range of niche gourmet foods and beverages from the United States, Italy, France, and Spain. You'll find a great selection of items from Tassimo coffee, gourmet coffee, balsamic vinegars, olive oils, teas, gift baskets, gourmet packs, gourmet olives, pastas, sea salt, to fragrance and beauty items and much, much more. Cyber Cucina ships within US. Stop by 58coupons first to view the latest Cyber Cucina promotions, savings and discounts. Shop at Cyber Cucina and you'll automatically benefit from their preferred customer discount program where you'll earn rewards toward a 10% discount for every $250 you spent. Click link for details. 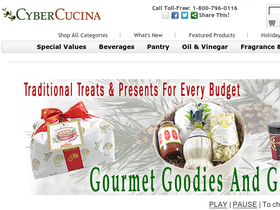 Enjoy free shipping on orders over $125 from Cyber Cucina. Click link and start shopping today. Visit Cyber Cucina's clearance section and find great buys discounted up to 50%. Click link to view the selection. Buy a case size of select items from Cyber Cucina and you'll save 5%. Click link to begin.